Do you Have a Regulatory Compliance Strategy? If your strategy isn’t rock-solid, you and your dealership is at serious risk. Did you know that regulators have started assigning personal liability for dealership violations? That means owners and principals are on the hook now too. This guide reviews the 5 golden rules for developing your regulatory compliance strategy. And it includes a handy worksheet to assess your current compliance landscape. It will help you focus in on your highest risk areas. There’s no better time than now to lower your dealership’s workforce compliance risk. 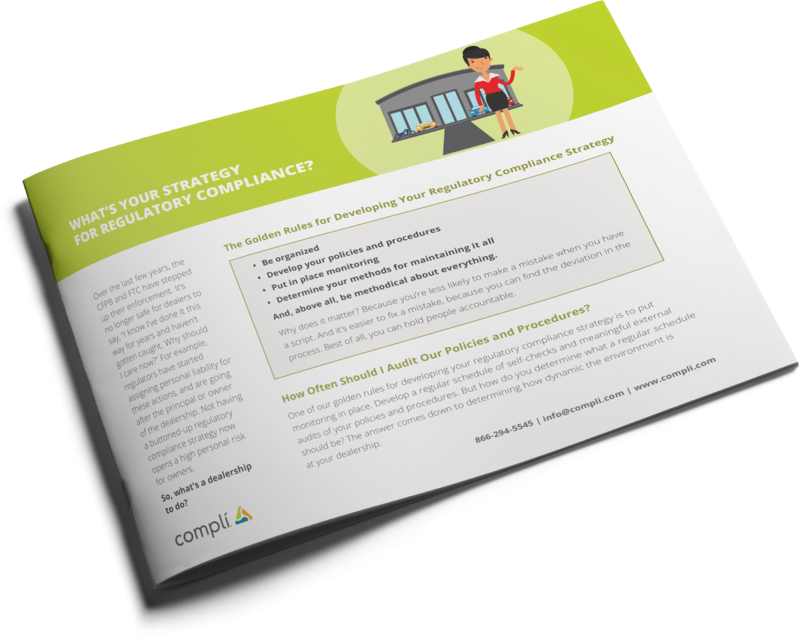 Download the Strategy for Regulatory Compliance Guide today. Do you know the answer to these two big questions? How often should I audit our policies and procedures? What if I get investigated? These days, if your compliance strategy is not completely buttoned-up, you’re opening yourself up to personal risk. It can be dealership-killing. Download this Strategy for Regulatory Compliance Guide today to find out if you and your dealership is exposed.